Does a need exist before the product or was it created in the process of production itself and the ensuing advertising and sales activities? The need must exist for a product. No amount of marketing can create a need for a product. While this statement may read like a gross generalization, if you consider the fact that ultimately we end up hiring a product to do something with it, it is easier to see the pre-existence of need. Not all our needs have to be rational – even someone buying a $5000 shower-head, however irrational it may sound, have a need to fill. The needs of all the customers are not all the same. Take the case of the Power Drill as a product. As Ted Levitt wrote, customers are buying holes but some are buying “many sizes of roughly right holes” while others are buying “one type of precise holes”. These two segments are most likely willing to pay different prices for their needs. The same product version cannot adequately fill the needs of both these segments. Even if customers buy the same product version- Some segments have the need for “precise holes” and buy top of the line Power Drill, others have the need for “image” and may buy the same Power Drill. In all these cases if we focused on the Power Drill, the Product, and its cool features we lose sight of the existence of segments and how the needs differ across segments. 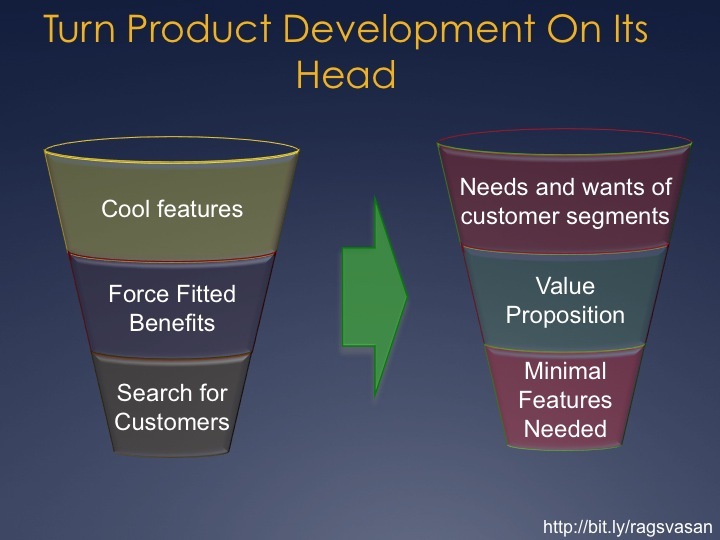 If we accept that needs must exist first and that needs vary across segments – it is easier to see why it is not “Product – Market fit” but it is “Market Segment – Product Version Fit”. How can we find the segment and the needs? We do not need to reinvent the wheel either, we have access to tried and tested marketing research tools that will set us on the right path to customer driven product development. ← Should your versions differ in quantity or benefits?